The moment I saw the pattern on Fir Valley’s inner sleeve I was reminded of the chevron floor from Twin Peaks’ iconic red room. To be fair, I’m reminded of Twin Peaks when I look at anything from a cup of coffee to a tree or owl, but my suspicions as to where Jason Turner’s main inspiration for his fine book lies were soon confirmed (and established in the book’s afterword). Fir Valley, North Vancouver, is another small secluded town where the beautiful natural landscape holds many dark secrets, and the residents have little to do other than fornicate and get high. Turner’s origins as a cartoonist show in his erratic but relatable character designs and dreamlike landscapes. His fractured narrative jumps between numerous characters at first, with little to tie a series of seemingly random events together. A has-been rock star spots men in animal masks in the woods at night. A man is murdered and his son is missing. This string of separate incidents soon begin to form an engaging underlying conspiracy, and much like Twin Peaks these supernatural events are in the background of plausible and grounded real-life, in all its pointless, tragic and inconsistent beauty. 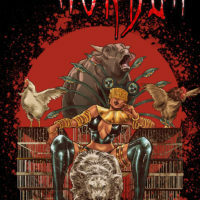 I really enjoyed Fir Valley, and if you like your fantasy mixed in with equal parts surrealism and soap opera, check it out at www.cloudscapecomics.com. 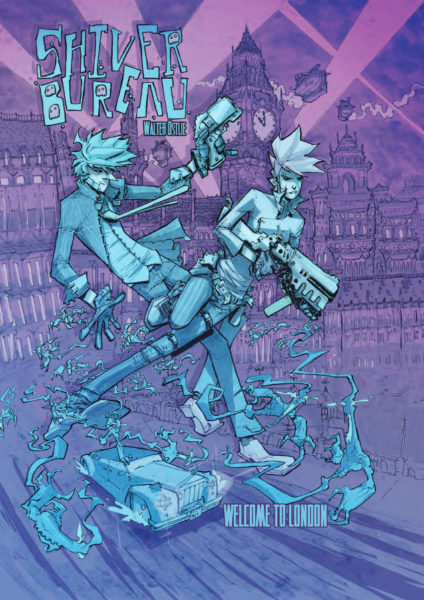 Oni Press’s Wasteland is another book that wears its influences on its sleeves (Mad Max, Fallout, spaghetti westerns) but Anthony Johnston builds his own grand mythology across these 752 pages. Yes, you read that right. 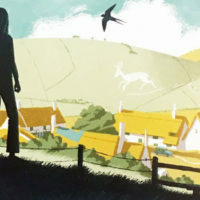 This is a mammoth read, comprising of several tales set in a post-apocalyptic world left lifeless “one hundred years after the Big Wet”, all written by Johnston and illustrated by a range of different artists, primarily Christopher Mitten. The book has a very old school, eighties 2000AD vibe to it, with Mitten’s bold black and white art better equipped for the visceral action than the barren landscape. 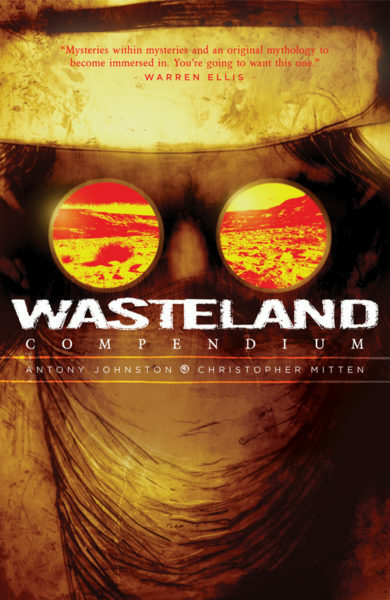 Johnston’s plot throws you in at the deep end, and while Wasteland doesn’t always do the best job of introducing new creatures or concepts, you’ll probably be far too engaged by the Western-inspired journey of formidable drifter Michael to hold it against the book. Some wonderful Ben Templesmith covers, too. 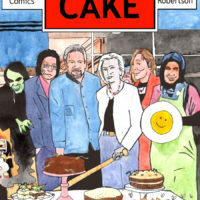 This energetic and tongue-in-cheek series from Walter Ostlie is best described as Ghostbusters in an alternate and extremely gothic London, where ghosts are no longer able to pass over to… wherever it is they’re supposed to go. Most of these ghosts, or shivers as they’re referred to, are harmless, but for the more malevolent ones there’s sinister agency the Shiver Bureau, and “Inspectre” Pickle and his reluctant partner Trish. Ostlie’s art is striking and defiantly cool. Shiver Bureau has a clear manga influence but it doesn’t really resemble anything else on the market right now. 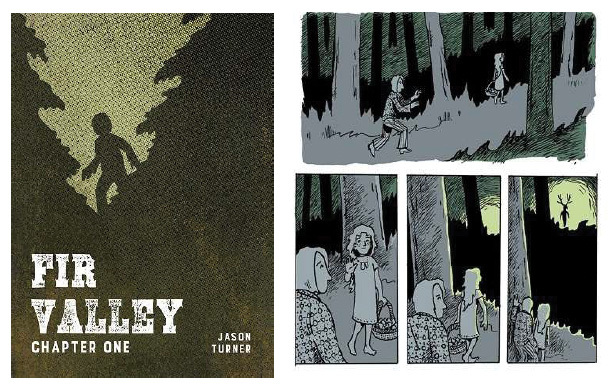 It’s fascinating to see his visual storytelling gain confidence over the course of the book, and an extensive section at the back highlights the effort that went into building Pickle’s world. Possibly even more interesting, and encouraging, is an early incarnation of the series from 7 years prior that shows just how much both Ostlie and his concept have evolved. 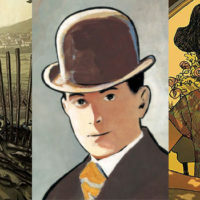 You can buy the first volume of Shiver Bureau, and indeed read the entire series, at walterostlie.com. 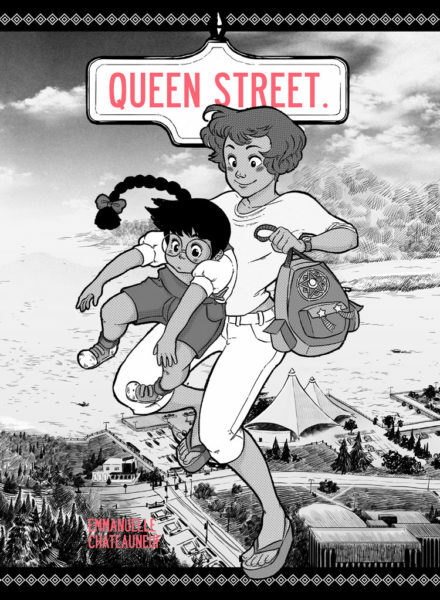 Queen Street, the debut graphic novel from cartoonist Emmanuelle Chateauneuf, is a semi-autobiographical depiction of Chateauneuf’s childhood as a Filipino immigrant in small-town Canada. Aimee traded a career at a prestigious law firm in Manilla for life as a full-time mother in Sault Ste. Marie, Ontario. Eight years later, and her partner’s distant job sees her raising seven year-old Melodie with little support. Chateauneuf approaches her material with a lightness of touch, with Melodie’s imagination taking the form of increasingly fantastical adventures. Her art has a jaunty quality to it, but this does not eschew a sense of authenticity in her depiction of the harsh juxtaposition between a struggling “single” mother and an intelligent but oblivious child who exists primarily in her own sweet world. 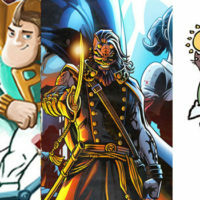 Queen Street is out later this month, from Chapterhouse Comics, a Canadian publisher perhaps best known for its Captain Canuck series. I’m not entirely sure that Stained should feature on Indie Penance, given that it’s published by Michael Bay’s intellectual property machine, 451 Media Group. But hey, I liked it enough to break my own rules. This new series from David Baron (best known as a colourist on such titles as Batman: the Black Mirror and Bloodshot Reborn) follows indomitable cyborg bounty hunter Emma London and a hunt for a priceless painting that uncovers a sinister underworld. You get the general idea. Stained is a proud genre work through and through, and here that’s not intended as a criticism. 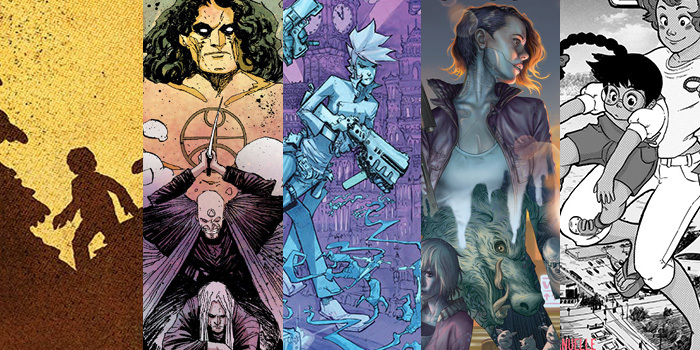 One of my biggest bugbears with a lot a science fiction comics is that they bombard the reader with copious exposition, sacrificing a gripping story for superfluous world building. 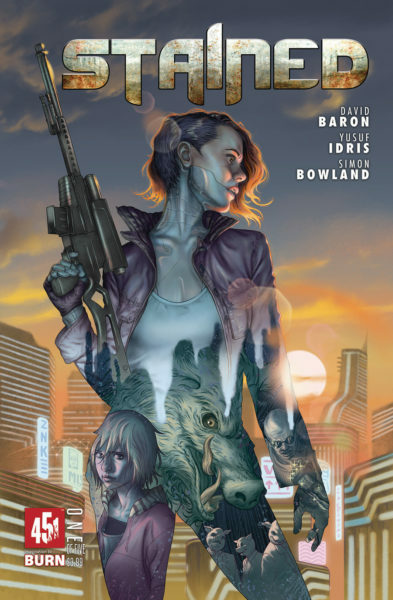 Baron, however, is a pro, and his script is as streamlined as it gets, fuelled by solid characters, familiar but well defined sci-fi concepts and elaborate but engaging investigations. 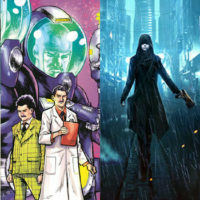 Stained isn’t mind-blowingly original, it’s simply a solidly entertaining comic from the get-go, and artist Yusuf Idris draws us into a very plausible future that, as with the likes of Minority Report or Looper, is basically today with a few unforeseen technological marvels.